The centennial of the Great Miami Flood of 1913 occured in March 2013. Many Miami Valley residents know there was a flood, but may not know it was one result of what is said to be the most destructive weather event in American history. And many who benefit today from protection by the Miami Conservancy District, built in response to the flood, may not know that it was an unprecedented achievement of continuing value and importance. Centennial anniversaries often focus on details of vivid events. They are also opportunities to recall how our ancestors responded to them. The Great Miami River Flood Centennial marks both a disastrous event and a time of historic accomplishment by volunteer civic leaders and innovative engineers. In the absence of significant government aid, leaders from cities across the Miami Valley united to raise funds for disaster relief and to build the Miami Conservancy District. It became a national model of regional cooperation, water management engineering, and community protection. At this important 100th anniversary we want to raise public awareness of the 1913 weather calamity and the responsive actions of community leaders. We remember the flood event, the relief effort, and the engineering success that remains a key asset for this region’s future. 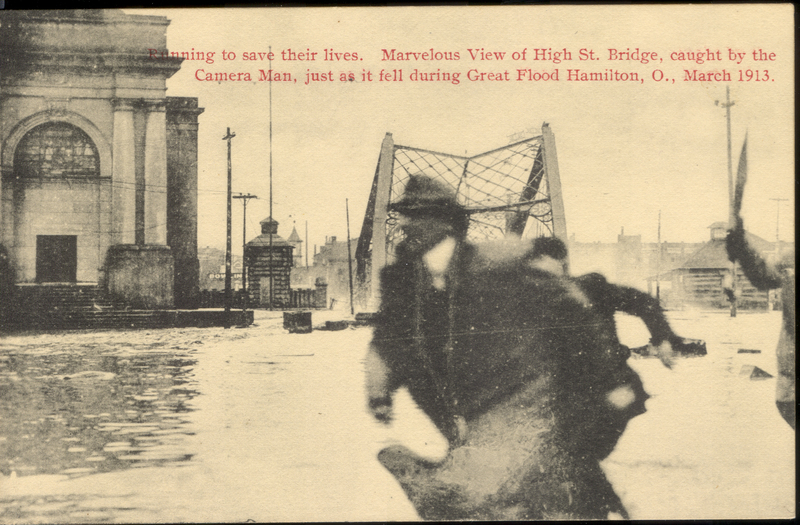 The Michael J. Colligan History Project maintains this web page as a permanent legacy project of the Hamilton Flood of 1913 Centennial Commemoration. Please visit our gallery of original images from the flood of 1913, as well as our souvenir gallery of commemorative events, featuring photographs by Jack Armstrong. Thanks for what you’re doing for the community. I’ve enjoyed the articles and have learned a lot. Ron Reitz, born and raised in Hamilon. The 3D map showing the 1913 flood zones is still a work in progress. As soon as it’s ready, we’ll be posting a link on this site!